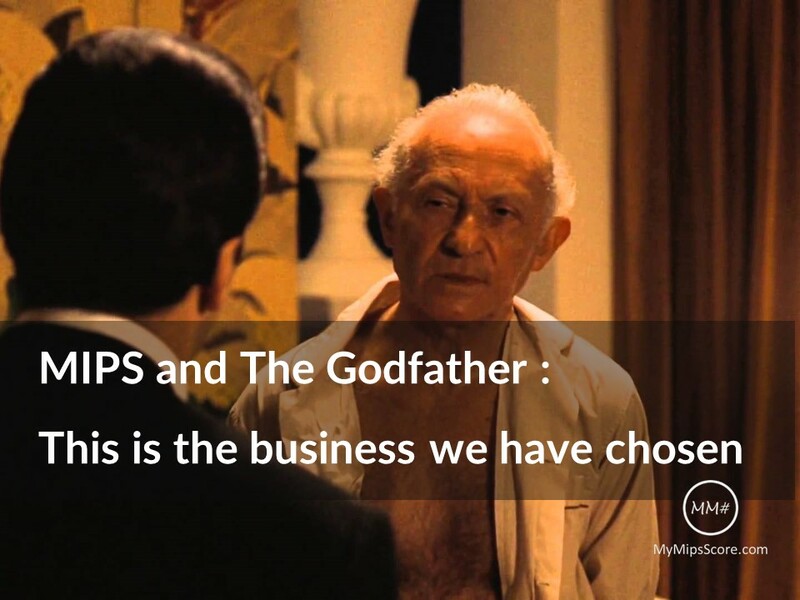 MyMipsScore: The Complete MIPS Solution - MIPS and The Godfather: "This is the business we’ve chosen." Last week, CMS held a support call for Qualified Registries. This was one of a regular monthly calls that all Qualified Registry vendors like MyMipsScore have to attend. These calls provide a great opportunity for CMS to share updates for the MIPS program with vendors as well as for vendors to get clarifications on any questions/issues we might be facing with our providers. There was an announcement by CMS during the call that I would like to share and discuss in this blog. Here is the exact text from CMS agenda. One of the key differences between MIPS and previous programs like Meaningful Use and PQRS is the shift from “Pay For Reporting” to “Pay for Performance”. As I discussed in a previous blog, the actual process of submitting the data has gotten much simpler than before. However, calculation of payment adjustment under MIPS is NOT on “all or none’ basis like it was for Meaningful Use. The payment adjustment is calculated based on a score called Composite Performance Score (CPS) or more commonly known as the MIPS score. This, combined with the fact that the MIPS score will be available on a public website, really raises the stakes for providers. MIPS score may be impacted by different factors based on the performance category. The interplay of these factors is a bit more complicated for the Quality category. We have discussed these factors on our webinars, MIPS Learning Center, as well as in blogs like this one. We have also discussed the impact of these factors on MIPS score for specialties with Cardiology as an example in this blog. The summary of all the above is this: It is possible for two providers with the exact same performance rate for same or different quality measures to end up with different scores based on what they actually submit and how they submit them. This may seem unfair, but there is logic behind it. We wouldn’t go into details here as it has been discussed in depth in the MIPS Learning Center. At a high level, the logic is based on comparing performance rates against benchmarks established for measures as well as submission methods. It may seem ironic but the goal of that is to actually level the playing field for all measures. CMS wants to encourage providers to choose measures that are not easy to achieve a higher performance rate and also wants the measures to be submitted electronically. Providers that take the extra effort to do that are rewarded by a better score even with lower performance rates. Our tools like MIPS Score Simulator help you analyze and compare various measures and submission methods in a very simple and intuitive way so you can understand this logic and make informed decisions. MIPS scoring is like a game and our goal is to provide tips, tricks, and tools to help you play and excel in the game in the spirit of the game. Taking the famous quote from Godfather - “this is the business we've chosen”. So What is "Cherry Picking"? Filter all the encounters during the reporting period. From all the encounters in the reporting period, count the number of encounters that have a particular CPT code. This becomes the denominator for the measure. Count the number of encounters that have a particular G code. This is used to calculate the numerator. Lets say you had 100 encounters during a reporting period. In 60 of those encounters, a code was added for meeting the criteria. Another 20 had a code for "performance not met" and 20 were not completed. In an ideal scenario, the 20 that had no code should/could be counted as "not met". However, CMS allows you to submit only 60% of your complete data. When the data is submitted, the provider can submit the data for only the 80 encounter and remove the 20 that had no code. Their data completeness criteria is 80% and the performance rate is now 60/(60+20) =75%. Is that fair? May be not, but that is the rule and totally acceptable by CMS. However, what if you remove the 20 encounters where you did not meet the criteria and only submit the 60 where you met the criteria. You are still meeting the 60% data completeness criteria AND now you have a 100% score. You just moved from a 60% actual performance rate to a 100%. This is what CMS is referring to above. One can argue that it is still within the rules. Notice CMS mentioned that it is not in the “spirit” of the program. If you are working with a registry that is advertising this, it is a choice you have to make. You may choose to not ask any questions and be ok with that business. If you do, you have been warned! In my opinion, it is much easier (and safer) to use the other options we discussed above for earning a better score. If you are not convinced, contact us and we can show you how we do it. We will also show you how we are leveraging quality data to create real value beyond just "meeting MIPS requirements". You can read an overview of our upcoming solutions here. I will also be presenting how we are leveraging this data at "Big Data" scale at the HL7 FHIR Roundtable in Washington DC next month. I hope to meet some of you there. If you like what you see, we will make you an offer you can’t refuse.